In 2007 the pass rate of the school at the Basic Education Certificate Examination was 64% and the school was ranked 25 out of 69 schools in district. 33 students were presented of which 21 passed. 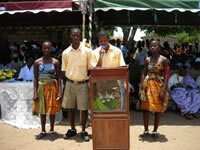 Of the 21, 15 gained admission into Senior high school, mainly local schools in Anloga and Keta. This result was better than the previous year in which the pass rate was 38% and the school was ranked 44 out of the 69 schools in the district. The school came first in the Annual Sports Competition in the circuit. 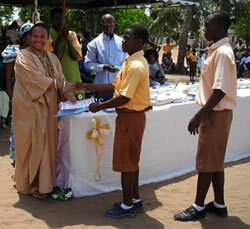 The school won the First Prize an educational quiz competition involving the local schools. The formation of a cultural troupe and a dance group in the school who performs at various functions. Large class sizes with some classes having 90 children with only one teacher. There is the need to recruit more teachers. 20-30 computers for the centre. The minimum specification will be Pentium III. They can be used computers. You can see more pictures of the Prize Giving in the gallery.